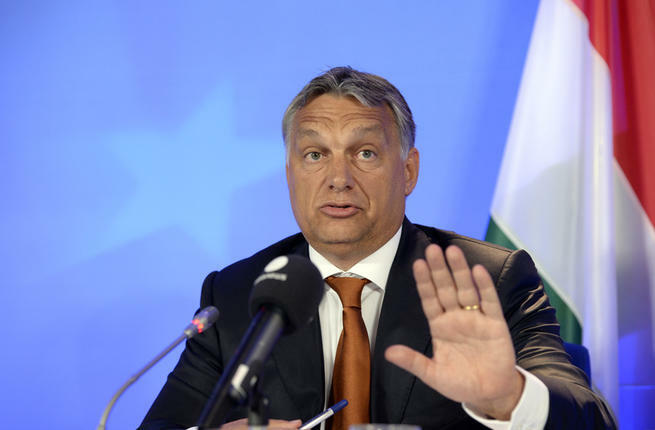 The European Parliament on Wednesday launched an action that could unleash unprecedented political sanctions against Viktor Orban‘s populist Hungarian government for posing a “systemic threat” to the E.U.’s founding values. The move dealt a stunning political blow to Prime Minister Orban, who had told the parliament a day earlier that a scathing report leading to the vote was an insult to Hungary’s honor and people. Adopted by 448 votes for to 197 against and with 48 abstentions, the motion marked the first time the parliament has itself initiated steps under Article Seven of the European Union’s treaty. An earlier action against Poland was initiated by the E.U. executive. The parliament issued a statement calling on E.U. countries to now “act against a member state to prevent a systemic threat” to such founding values as respect for democracy, the rule of law and human rights. The vote takes the first steps under Article 7 of the E.U. Treaty, known by some in Brussels as the “nuclear option”, which could ultimately strip Hungary of its E.U. voting rights. Other E.U. governments could halt any further action, however, and Poland has warned it would do so. “Hungary will protect its borders, stop illegal migration and defend its rights,” said Orban, who embraces a vision of a Christian Europe and opposes an influx of Muslim and other migrants. Opposition to Orban’s vision does not just come from the left, with disquiet also in the main center-right parliamentary group, the European People’s Party (EPP). The EPP’s leader, Manfred Weber, said he would vote in favor of the motion against Orban’s government, whose Fidesz party belongs to his grouping. Weber, who is a candidate to succeed fellow EPP member Jean-Claude Juncker as head of the commission next year, saw his bloc voting 115 for, 57 against with 28 abstentions. But Hungarian government spokesman Zoltan Kovacs claimed in a tweet that the motion failed because the overall vote did not receive the support of two-thirds present. It was not immediately clear if Budapest will launch a legal challenge. But parliament spokeswoman Marjory van den Broek told AFP the body’s legal services determined previously that “two-thirds of votes cast” is needed, with abstentions not counting as votes cast. While Orban’s actions have provoked opposition, they have been applauded by populists in the E.U., with prominent far-right figures floating the idea of forging a pan-European alliance ahead of next year’s elections. The Commission has repeatedly clashed with Orban’s government, especially since Budapest refused to admit asylum seekers under an E.U. scheme launched at the height of the migration crisis in 2015. Wednesday’s vote was hailed as “historic” by Berber Biala-Hettinga, Amnesty International’s expert on human rights in the E.U. European People’s Party and Fidesz: Which Way for Europe’s Center Right?